Dylan Hysen, Beatriz Mourad, Alex Bonilla, and special guest K-K Bracken, organizer of Beach City Con, delve into “Can’t Go Back” & “A Single Pale Rose” once again, discussing topics if Rose is a bad person and the Zoo. Find information on Beach City Con here, and you can use promo code “OVA” for $5 off when buying tickets! 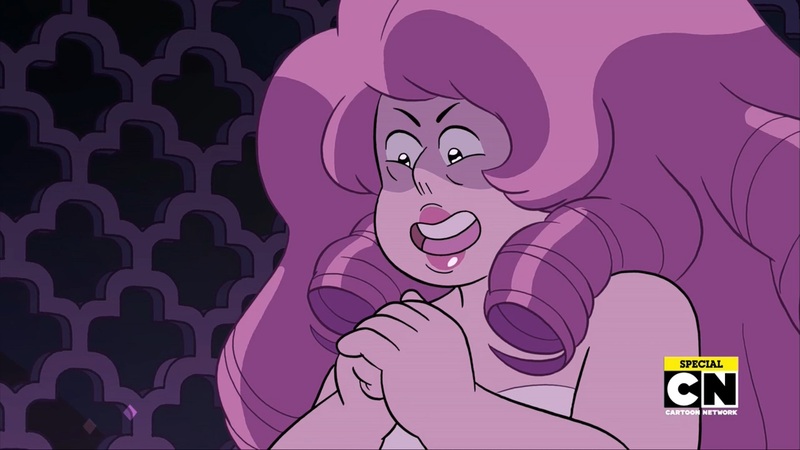 One thing about Pink becoming Rose: she might have decided to create Rose because if the rebellion is based around a diamond, then it’s not really a rebellion. The gems under her would be pre-programmed to follow her, which would defeat the purpose of the rebellion. That’s not to say she shouldn’t have tried harder to enact change from her position of authority, but if that failed, then becoming Rose might’ve been a good idea. As for the zoo: I mean, we like to put animals in zoos, and gems saw humans like how we see animals, so Pink making a zoo of humans kinda makes sense. Her having relationships with humans now seems much more awkward though. I’m just thinking about what was Pink’s relationship with the other diamonds I can’t help but to feel there was something more to Pink wanting to be Rose and I think her relationship with the other diamonds must of played a bigger part into it since Pink is in a high status she could have used her power to stop colonizing earth but we don’t know her power level as a diamond maybe she did try to come to Blue & Yellow maybe not because she didn’t want to get involve maybe because she’s not powerful enough to do anything compared to other diamonds she is the smallest out of them and possibly the least powerful compared to the other diamonds. Also I wonder what exactly lead Pink to say Blue & Yellow wouldn’t care about her death I can’t help to think about the other diamonds dealing with Pink in Jungle moon and in Can’t go back there must be a reason why we’re being shown Pink’s interactions with them. (1) They don’t take her seriously. They laugh it off as naivety and tell her to get back to work. (2) They take her seriously and shatter her as a traitor. This is what we theorized happened when we thought Yellow Diamond was the murderer. I thought of these while listening to the recap, but it didn’t seem worth bringing up, because at the time, I agreed with K-K that Rose had avoided conflict with her sisters. Until a piece of fanart triggered a realization that made me drop everything to rewacth a recent episode. Now, Dylan’s gonna hate this buuut: “Your Mother and Mine,” 5 minutes in, “Rose” confronts “Pink” Diamond about killing humans, but the Diamond laughs her off and tell her to get back to work. That’s the story Rose told the Crystal Gems; I think it’s highly likely that it really happen, but Rose changed the names. Now, it’s possible that she made it up. EXCEPT! (1) The event marked a historically verifiable change in tactics. *Something* happened to Pink at that time. (2) Everything we know about Pink says she was terrible at thinking ahead. Why would she both dodge the conversation and invent a plausible script? TLDR: nearly everything in “Your Mother and Mine” really happened, but Rose changed the names when she told Garnet.